The Pay-Per-View Tickets usage analytical data gives you an in depth view on all of your Pay-Per-View Tickets usage data. For more information about analytics you can visit our Real Time Analytics information page as well as our Pay-Per-View information page. Select the Pay-Per-View Password Usage section. 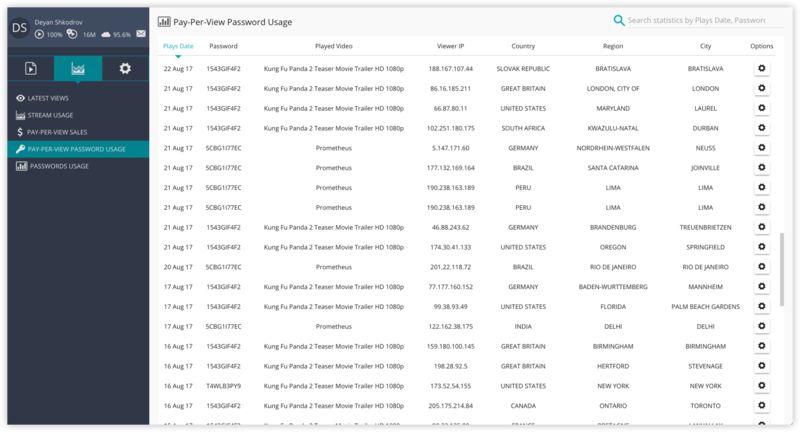 Here you will see the latest usage statistics for your Pay-Per-View Passwords. Back to overview: This will take you to the detailed Pay-Per-View Sales Analytics for the selected Pay-Per-View Ticket. You can also use the 🔍 Search Field in the top right corner to search for a specific Pay-Per-View Password.